A Qoute-Gez, one old man is bad enough, now I have to listen to Fury too. Climb/Jump: 6D, Lifting: 4D+2, Brawling: 6D, Stamina: 5D, Swimming: 4D+2. Harness: Hawkeye's tunic harness has special quick release compartments capable of holding 36 additional arrowheads. Quiver: The quiver has a 36-shaft capacity. Each arrow is clamped to the base and unlocked by a slight twist whilst being drawn. 12 standard target points inflict 4D+2 shooting damage. 6 have 3 bladed broadheads inflicting 5D+2 blunt shooting damage. The 12 target points can become "trick arrows by adding a modular arrowhead from his harness. Explosive: 6D damage, acts as a grenade. Flare: Provides light for a 40 diameter radius for D10 rounds. Net: Entangling attack. Difficult Roll to detangle. Smoke: Fills 40 ft square area for 4 rounds. All sight based perception rolls are at -2D. Sonic: 6D intensity. Must make a Difficult Stamina roll or be stunned for 1-10 rounds. Tear gas: Must make a Difficult Stamina roll or be stunned for 2-20 rounds. Clint Barton's parents were killed in an automobile accident when he was 8 years old, and he and his older brother were placed in a state orphanage. At 14, Clint and Barney Barton ran away to join a traveling carnival. There, Clint apprenticed himself to the carnival's star attraction, the mysterious rogue known only as the Swordsman. Recognizing Clint's natural flair for archery, the Swordsman agreed to tutor him in the art. For four years, the youngster practiced with the bow and arrow eight hours a day. Soon, he became good enough to perform professionally as a trick-shooter under the name Hawkeye the Marksman. After witnessing the armor-clad Iron Man in action, Barton decided to emulate the hero by donning a colorful costume and using his archery skills to fight crime. But during his first public appearance, Hawkeye was mistaken for a thief and found himself battling the adventurer who had inspired his efforts. Weeks later, his attraction to the Russian spy called Black Widow led him to commit further criminal acts. However, Iron Man soon learned of Hawkeye's true intentions and sponsored him for membership in the Avengers, Earth's Mightiest Heroes. 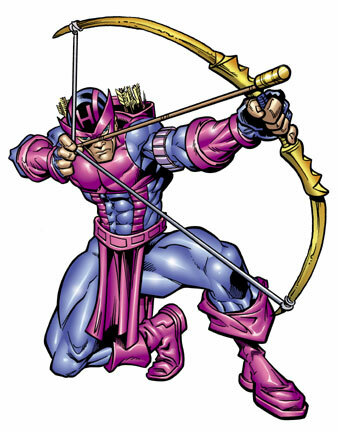 Hawkeye served as an active member of the Avengers for years, his archery skills complimenting the superhuman powers of his associates. During one of his frequent leaves of absence from the team, he married fellow crime fighter Mockingbird.